Last week I left a vacation to go and be with her in Connecticut as much as was humanly possible, so one of the minor consequences of the pneumonia is that I’ve been out-of-town forever and ever and I can barely even remember where the vacation was, at this point. I needed to come back to Brooklyn for a few days. But on my way back, before I was even on the stupid highway and had at least 2.5 hours to go in the drive, someone drove smack into the back of my car. That my son was in. We are fine, though I am achy and disheveled and now forced to deal with thousands of insurance related phone calls. Oh, and my car is rather fantastically smashed, though “driveable,” according to the police. When I finally arrived on my street in Brooklyn, I had to park on the street and carry in my belongings (and child) from the trip including the stroller which was in the trunk. But once the trunk was opened, it was clear that there was no way it was going to close again. I stood there and looked at the car. It now has a very pronounced underbite. Overbite? The trunk does not close; you tell me. I did a little stint of yoga breath. You know what is really helpful in the world? Yoga breath. Whichever skinny, wizened, sinewy Indian invented it is a full-throttle genius, because it makes everything easier: from yoga; to dental procedures; to not winging the cat’s pretty little glass food bowl across the room when you really want to; to pausing while you figure out what to do with your car, whose jaw is dropping as much as yours is. Then I called my landlord, who is an 87ish year old artist who lives upstairs. One of the great things about 87 year olds is that they are almost always at home when you call them, and this one is really handy, too. As well as nice. I told him that the trunk of my smushed up car wouldn’t close, and that I really couldn’t figure it out, and could he could just please come outside and figure something out for me. And he did, and I love him. All I have to do is sit at my desk slash attend meetings and blah until six something, at which point I can go home and rest. And thinking of things in that way sort of does work. So this week, all I need to do is call the insurance company and make some dinner and put the baby to bed and do my job and then rest, until we go back to Connecticut. When things are grim, things that aren’t grim can either seem 1) grim or 2) amazingly bright and shiny in contrast. To play to this second option, I have started to read Tom Jones in the bathtub during Epsom salt soaks. I have granted myself full short-term permission to watch Mad Men in the afternoon if I feel like it. (Okay, I only watched 20 minutes of it during an afternoon, once, but it really did wonders for my “I’m doing whatever I want” attitude, since it was such a departure from my world.) And I’m thinking up things that embody a sense of delight. Which brings me, finally, to the Mangosteen question. Fruit, as you might know, is in general such a crazily magic invention that it goes neck-and-neck with the Ujjayi breath. Ah, who are we kidding, fruit wins. But it can be easy to take the bright, juicy, sweet and tart magic of an orange for granted if we have one every day. There is a poem about a fruit so wonderful, so mythical, so rare . . . the mangosteen. I thought it was by Lewis Carroll but I can’t find it. Lewis Carroll: also magic. Do you know the poem? Can you help me out? I would like to see this poem. I would like to share it with everyone who reads this blog. It would make us all happy. Have you had mangosteen? I had some mangosteen juice a few weeks ago at the Purple Yam on Cortelyou. Along with something called “sugar-cured pork steak,” or something, which is just what it sounds like. Oh, and there were some eggs on the plate, so we could pretend that it was actually a viable meal, rather than a playmeal of pigmeat soaked in sugar capped off by mythical juices — because no one would believe that meal. That meal would be like watching TV in the afternoon. Hence, the eggs. Anyhow the mangosteen tasted like passionfruit. 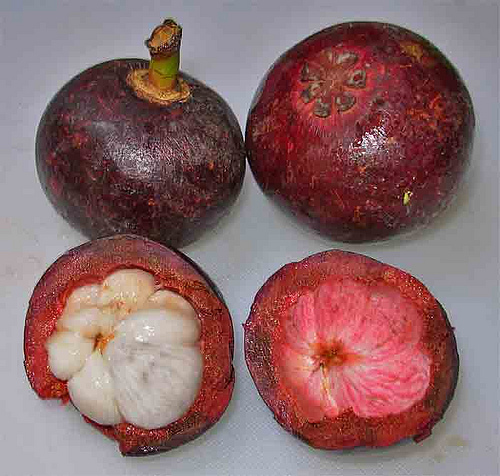 Which is basically the most delicious fruit ever, but the description of mangosteen was so otherworldly that I figured we’d be going somewhere else on the spectrum of deliciousness. Sometimes I would like to be able to draw the arc of a flavor. Drawing is not a thing that falls within my purview but I wonder if there is a system anywhere set up for that. Pointy, round, fizzy, salt, can we communicate with shapes and color? This post is all over the place. Honestly, can you blame me? I love this post. I’m sorry things are so unbelievably difficult right now. I really wish there were something I could do to make it better. Maybe I can track down that poem. Shouldn’t the internet be able to do that!? Wait, wait, wait! I somehow didn’t read this post when it happened but only now. And I can’t believe you got rear-ended with your baby in the car and your car is smashed and it happened when you were on the way home from visiting in the hospital and life is so unfair sometimes! I am glad you are Epsom salting because that is a good thing to do anyway but especially after the various traumas of vacation, vacation being cut short, spending lots of time in hospitals, worrying, and getting in a car accident. I wish I could take you to see my opera-singing chiropractor who I met after someone ran into the back of my car and made it not work. She is pretty and wears the kind of shoes that it seems like a chiropractor would tell people not to wear. Big hugs! Also, here is a mangosteen poem. Though, I am pretty sure, not the one you want. The gibbons’ sad cry at night. We shared a half bowl of rice to fight off hunger. We cleared forests, our backs slashed by thorns. Our sweat watered the ground, our hearts burned. The rice and sweet potatoes greened and grew. The Mangosteen leaves so bitter, but the yam roots so sweet. Even eating bland rice, we laughed. in the half-smoked cigarette passed between us. Hi – did you ever find that poem about mangosteens? how much, or whether it was ever claimed. The skin was bitter. It stained the tongue. This is fantastic! No, I never found what I was looking for. I need to look for that poem again. But thanks for sharing this one! Hi 🙂 No problem at all, I hope you liked it and I’m sorry it isn’t the right one!